Available in 2 versions: (1) Black mat which is grease-resistant and carries a 1-year warranty. 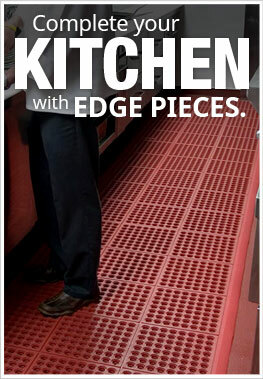 (2) Red mat with extra nitrile content is grease-proof and carries a 5-year warranty. We bought these mats to put on the floor of our 4-H food stand during the county fair. We cook 800 pounds of hamburgers in 4 days. That makes for a lot a grease and a lot of spills emptying the grill of grease. When we spilled we just soaked up the grease with some paper towels. We pulled up the mat only where the spill was, wiped up the worst and put the mat back down until the end of the day. At night we pulled up that spot again and ran a mop over. When the fair was over we picked up all the mats, swept and mopped only once. We used to mop the whole kitchen 2 or 3 times every night because it got so slippery. This made it a lot easier. AND I am there for at least 14 hours a day. Before we got the mats my legs would hurt so bad I couldn't fall asleep. This year my legs were still tired from such long days but I didn't hurt.